Huawei didn't present any flagships at MWC this year, and is instead gearing up to release the next generation P-series flagships on March 27 in Paris. Thanks to HDBlog, we now know that the Lite version has made a silent debut in Italy, so we can finally confirm the specs, price and features. We already know that Huawei silently releases the Lite editions on Amazon and in physical stores, usually a few days after the launch of its flagships. It was therefore expected that the P20 Lite would appear in early April, after the Paris press conference scheduled for March 27th. After all, the rumors have shown that the P20 and P20 Pro are the stars of Huawei's event. It is clearly a chance for the brand to show off its flagships. In the meantime, lots of details about the Lite version have been revealed by several leakers. This could explain Huawei's decision then. 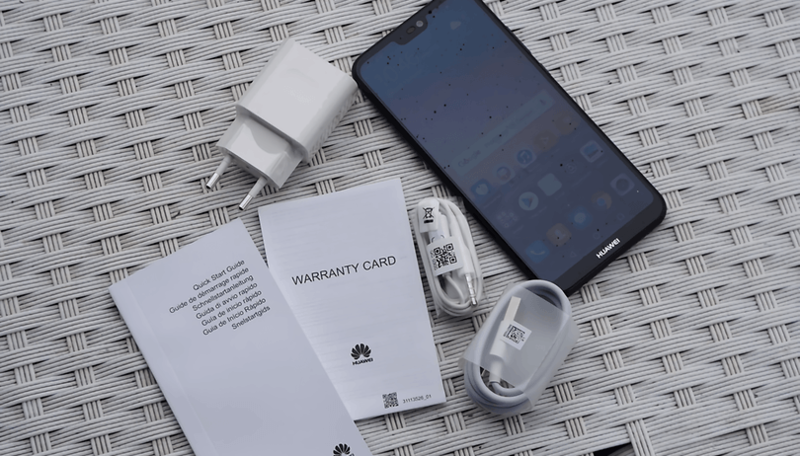 Due to this version being subject to so many leaks, Huawei may have decided to make the device available as early as possible. Alternatively, it could be a move to make us more excited about the conference at the end of the month. For now, we can only speculate, as no statement has made. Let's hope it will be made available in the US and UK soon. Enough with the rumors, the P20 Lite is here, and although we're still waiting to get our hands on the device, we can see some real photos and specs at last. As anticipated, it looks like a high-end device. In the photos posted online, you can clearly see the notch. For the rest, the P20 Lite has a sleek design with rounded corners, and we wouldn't expect anything less from Huawei and Honor. Located on the back is a dual camera, and the fingerprint reader, which is what we expected. Along the lower edge, you can see the USB Type-C port and the speaker. Huawei has decided to introduce the trendy notch on the P20 Lite. We thought this would only be featured on the other versions, but the brand clearly wants to give everyone the opportunity to get their hands on this latest technology. The black indent in the upper part of the display surrounds the earpiece, proximity and brightness sensors, as well as the 16MP front camera. The P20 Lite can be unlocked with a smile using facial recognition. The system is similar to the OnePlus 5T and the Honor View 10, rather than that of the iPhone X. If you're still skeptical about this mode, the old and reliable fingerprint reader is still there. OnePlus 5T vs Honor View 10. Who wins? The screen has a 19: 9 aspect ratio, HD+ resolution of 2280x1080 pixels.The diagonal for the Lite version is 5.84" and as you can see in the pictures, the corners of the screen are rounded in style Galaxy S8 and LG V30 . The presence of a dual camera (16 + 2MP), until now, was exclusive to the standard and pro versions. The camera module is similar to the iPhone X (as if the notch wasn't enough already), as it is slightly raised and vertical, and features lettering besides it reading 'Dual Lens'. The device packs the Kirin 659 octa-core processor, supported by 4GB of RAM and 64GB of internal memory expandable via microSD. On the software side, it is running EMUI 8.0 and Android 8.0 Oreo. It has a 3000 mAh battery, and regarding connectivity, the P20 Lite is equipped with 4G VoLTE, WIFI 802.11 b / g / n, Bluetooth 4.2, GPS / GLONASS, NFC. We're impressed by the P20 Lite so far! The Huawei P20 Lite is available for purchase in Italy at a price of 369 euros (around $450). A price tag which has risen by around $20 compared to the P10 Lite last year. The competition is ever fierce between Huawei and its sub-brand Honor (P8 Lite 2017 and Honor 9 Lite are an example). But fear not, as always, we expect even the P20 Lite to lower its price soon. What do you think? Does the Huawei P20 Lite look tempting to you? This phone looks too much like the iPhone 10, so it's a deal breaker for me. good price for what you get! look at the Samsung s8, twice the price, same storage, same battery, ram, dual camera, it hangs with flagship devices, but a few hundred dollars cheaper. A good value, and a nice phone. I would consider this phone as a choice. I agree completely. A giant bottom bezel and a notch at the top just doesn't make sense aesthetically. If it comes with nfc, and a low price, could be a winner, in spite of the notch. I want to like this phone, but the notch is a deal breaker for me.